Near the edge of the visible Universe are some of the brightest objects ever observed, known as quasars, which are believed to contain supermassive black holes of more than a billion times the mass of our Sun. Simulations by Kentaro Nagamine at Osaka University's Department of Earth and Space Science, Isaac Shlosman at the University of Kentucky and co-workers have revealed for the first time exactly how these black holes formed 700 million years after the Big Bang. "The early Universe was a dense, hot and uniform plasma," explains Nagamine. "As it cooled, fluctuations in the mass distribution formed seeds around which matter could gather due to gravity." These are the origins of the first stars. Similar processes might have later seeded the growth of bigger structures such as supermassive black holes. Until recently, many researchers thought supermassive black holes were seeded by the collapse of some of the first stars. But modeling work by several groups has suggested that this process would only lead to small black holes. 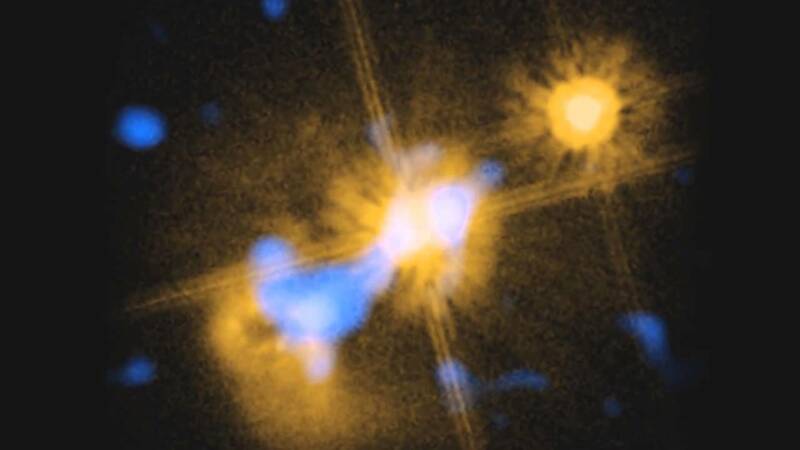 Nagamine and co-workers simulated a different situation, in which supermassive black holes are seeded by clouds of gas falling into potential wells created by dark matter — the invisible matter that astronomers believe makes up 85% of the mass of the Universe. Simulating the dynamics of huge gas clouds is extremely complex, so the team had to use some numerical tricks called 'sink particles' to simplify the problem. "Although we have access to extremely powerful supercomputers at Osaka University's Cybermedia Center and the National Astronomical Observatory of Japan, we can't simulate every single gas particle," explains Nagamine. "Instead, we model small spatial scales using sink particles, which grow as the surrounding gas evolves. This allows us to simulate much longer timescales than was previously possible." In other recent work, Nagamine and co-workers described the growth of massive galaxies that formed around the same time as supermassive black holes. "We like to push the frontier of how far back in time we can see," says Nagamine. The researchers hope their simulations will be validated by real data when NASA's James Webb Space Telescope, due to be launched in 2018, observes distant sources where direct gas collapse is happening.